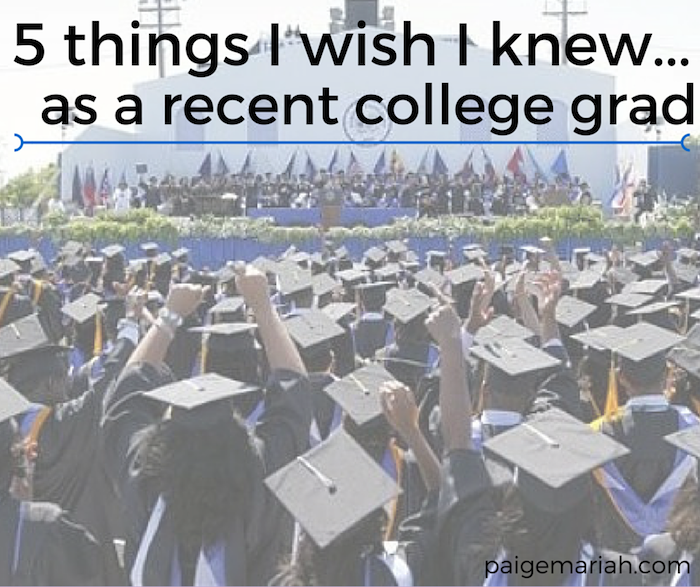 5 Things I Wish I Knew As A Recent College Grad! I still can’t believe that it has officially been 2 years since my graduation from Hampton University! My time in college was probably the best 4 years of my life.. but of course there were many stressful times as well. However, those times were probably no where near as stressful as my first few months out of college! I know that there are many recent grads who are beginning to feel this stress right now, so I thought that there was no better time than to share the top 5 things that I wish I knew as a recent college grad! It’s totally alright to not have every detail of your future all laid out as soon as you turn the tassel of your graduation cap to the left. Yet, I know that it can be pretty intimating to watch everyone around you and on social media, announcing their job offers and grad school acceptances, while you’re just not quite sure about your next step. At the end of the day, it is important to remember that everyone’s journey is unique and as long as you’re taking the right steps and being positively productive, things will begin to come together and make sense a little more and more each day. It’s okay to move back home with your parents. This was something that I had to keep reminding myself for the entire first year that I was back at home! While I was in college, I was so sure that I’d move out on my own immediately after graduating. However, after a lot of talking with my mom and ultimately snapping back into reality, I realized that moving back home would actually be the best option for me at the time. My parent’s generosity has allowed the money that would normally go towards rent and utilities, to instead be stacking up in my bank account. I’ve been able to set a pretty high money savings goal for myself and even purchase my first car in my name last year. Now, don’t think I’m advising you to mooch off of your parents forever! As much as I’m ready to be out on my own, I know that I’ll feel so much better doing so once I’ve hit my savings goal. Patience is a virtue my friends. A college degree does not guarantee immediate job offers. Before graduation, I was naively under the impression that if I did well in school, interned and earned my degree, that finding a full time job would be a piece of cake. I even opted to complete one more summer internship after graduation for just a little more experience. Once the end was near and I began applying for full time work.. I quickly learned that I was mistaken. Finding a job was hard. Offers were not being thrown at me left and right and most of my applications actually went unanswered. However, I knew that I had to keep trying. I applied for at least 10 jobs in my field a day and was finally offered a position I could have only dreamed of for my first career job. Though this period may be frustrating, it sure is humbling. Don’t give up! I don’t think this tip even needs much explanation. As soon as I began my career my Mom was immediately on me about saving. At first I didn't quite understand why she stressed it so much but I quickly understood. There is no bigger favor that you can do for yourself after graduation than to begin building your savings. You never know what situations you will be presented with in the “real world” but being prepared for those rainy days will definitely save you a lot of stress in the end. Entry level salaries are not always the highest and being at the bottom of the totem pole doesn’t quite scream job security. There is no better feeling than knowing that you will be able to take care of yourself in those unexpected life situations, so save as often and as much as you can! Like I always try to remind myself and others.. you must trust your own journey! You will save yourself a ton of stress once you realize that you simply can’t compare your success to others. Sometimes you will have to sit back and watch on while you cheer for others and when it is your turn, they will be cheering for you. Your future is bright and the options are endless. Trust in the unique timing of your life and remember what is for you, will be yours! What’s one thing that you wish you knew as a recent college grad? Share in the comments! These are so so so relevant. I graduated from undergrad 4 years ago and masters 2 years ago and I JUST celebrated my first work anniversary at my permanent job. It's really okay to not have it figured out but everyone seems to think they need to. And seriously, saving is so important. Nothing's ever truly permanent and life happens. My fiancee lost her job a few months ago and it was only through our savings that we were able to make ends meet until she finally found a new one just last week. I wish people had told me how difficult freelancing would be. I did it for 4 years and my taxes were a nightmare. Not knowing when my next gig would be was a nightmare. Everything was way too uncertain for me and while I loved the work I did when I had it, I'm glad to be taking a step back from it now. Ugh. Saving is so important!! My parents always said they would welcome me back home when I graduated but I was able to find a job and have a pretty good savings to fly to coop!